The modern synthesis employs mathematical (statistical) methods to study what is called a population, the collection of those members of a particular species living in a specified area. Population genetics considers the collective gene pool of such a population, i.e., the sum of all alleles – versions of genes[ref]More specifically, gene variants at the same positions on homologous – corresponding – chromosomes. All this gene business will be explained in a later chapter. [/ref] – within the population. A given gene may have more than two alleles, such as those for human blood antigens (A, B and O). The link with what we actually see comes about when these alleles are expressed as phenotypes, i.e., observable traits in the organisms of the species. Evolutionary scientists measure the changes in the distribution (frequency) of the alleles in the gene pool across generations. The underlying genetic composition of the phenotype is the genotype. Genetic drift occurs when a chance variation (due to mutation) reproduces itself and then gradually becomes important in the gene pool. According to statistics, the range of values of a trait will be well represented by the normal distribution (the famous “bell curve”) in a large population of samples. Since a large population furnishes numerous possible mates, any variation probably will be quickly diluted. Therefore, genetic drift takes place more often in smaller populations which are less statistically significant. Genetic drift occurs most frequently when a sub-group of a population becomes physically separated from the main group, say, due to emigration to an island or environmental isolation by the forming of a new body of water or a mountain ridge – or even just due to large distances between extremities of a vast landmass. The small group may then change sufficiently to form a different species. Such speciation (formation of a new species) due to an external barrier to gene flow is called allopatric[ref]Also referred to as geographic or vicariant. [/ref], (Greek for “another country”). Since it is due to chance, genetic drift need not be adaptive. Natural selection, on the contrary, is adaptive and so can not bring about evolution of a lasting trait which is bad for the organism. Evolution can give rise to two kinds of similar structures. Characters[ref]The word “character” refers to a heritable trait and may be morphological, genetic or behavioral. I would have said characteristics, but nobody asked me. [/ref] of different species which are inherited from a common ancestor are called homologous. An example is the presence of the four limbs of tetrapods. Similar characters which are not inherited from a common ancestor are analogous, like the wings of bats and birds, and are the result of convergent evolution, the evolution of similar adaptations in species which are at most distantly related. The goal of evolutionary classification is to demonstrate and explain relations among species. The method uses hierarchical grouping of species into larger groups called genera (singular, genus), genera into families into orders into classes into phyla into kingdoms. [ref]There are many mnemonics for remembering these, of which I prefer: “King Phillip Came Over For Good Spaghetti”. [/ref] This amounts to a road map or genealogy of evolutionary relations. Since two species may be related by being descendants of a long-extinct ancestor, information about that extinct ancestor is necessary. This is obtained primarily through the evidence of fossils. From the number of species alive today and the “turnover” seen in fossils, an estimation of the number of species which have existed during Earth’s history gives numbers in the billions. But the fossil record only contains some hundreds of thousands, so the fraction of the number of past species in the fossil record is much, much less than 1%. [ref]Reznick (2010). [/ref] Where have all the fossils gone? 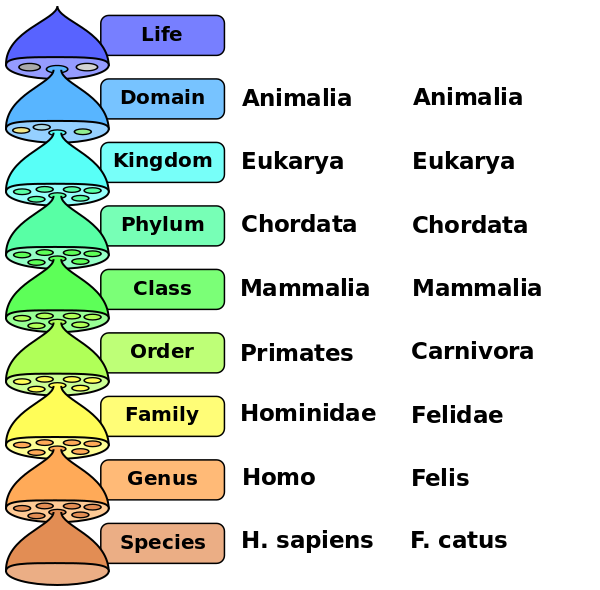 The branch of biology called taxonomy is the science of defining groups of organisms based on shared characteristics in order to show up their shared evolutionary history. The result may be displayed as a family tree or phylogeny. Biologists use cladistics, or phylogenetic systematics, to diagram the evolutionary steps between species. An example of such a diagram is in the above figure. A clear distinction is made between primitive characters[ref]The word “character” refers to a heritable trait and may be morphological, genetic or behavioral. [/ref] and advanced or derived characters. Only groups defined by common derived characters are considered valid monophyletic groups or clades, which are groups descended from a common ancestor and which include all descendants of the common ancestor. Monkeys and apes without humans do not constitute a monophyletic group, nor do reptiles without birds. 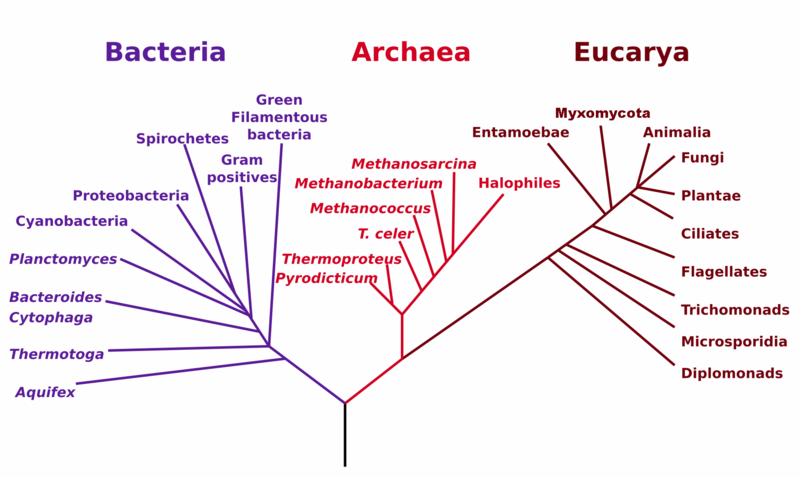 It is important to understand that a phylogeny is a tree, not a ladder, and implies nothing about whether an organism is “advanced” or “primitive”.